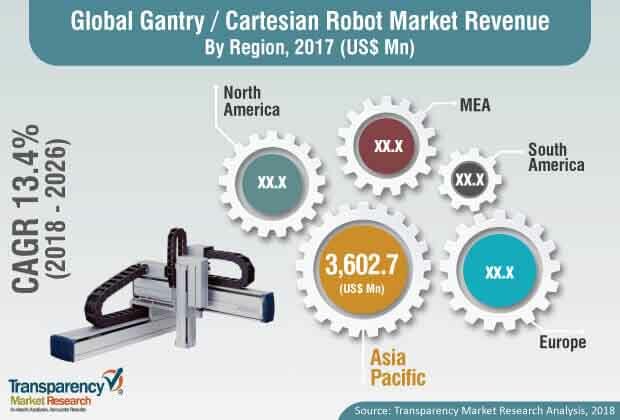 The global gantry/cartesian robot market was valued at US$ 7,752.0 Mn in 2017and is projected to expand at a compound annual growth rate (CAGR) of over 13.4% from 2018 to 2026, according to a new report published by Transparency Market Research (TMR) titled ‘Gantry/Cartesian Robot Market – Global Industry Analysis, Size, Share, Growth, Trends, and Forecast, 2018–2026.’ This is mainly due to an increase in adoption of automation in industrial applications across the globe, which is likely to boost demand for gantry/cartesian robots. Moreover, huge demand for gantry/cartesian robots across healthcare, industrial, aerospace, and automotive sectors is expected to propel the market during the forecast period. The global gantry/cartesian robot market has been segmented based on axis type, end-use industry, and geography. In terms of axis type, the market has been divided into 1-Axis, 2-Axis, 3-Axis and 4-Axis. Based on end-use industry, the market has been classified into automotive, electrical & electronics, food & beverages, pharmaceuticals, manufacturing, and others (rubber and plastics industry). Based on geography, the market has been segmented into North America, Asia Pacific, Europe, Middle East & Africa, and South America. The 3-axis gantry/cartesian robot provides an easy to specify, cost effective X-Y-Z handling system. It helps to move almost any length, and is scalable and suitable for light to heavy / hanging loads. Hence, 3-axis is expected to contribute toward growth of the market during the forecast period. Additionally, gantry robots offer significant advantages over articulated arm robots for high speed automation with their capability to handle large payloads and span great distances. The different axes can be upgraded or changed with relatively little reconfiguration to suit evolving product or application requirements. The 3-axis segment of the global gantry/cartesian robot market is projected to expand at a rapid CAGR of more than 13.9% from 2018 to 2026. In terms of end-use industry, the electrical and electronics segment is anticipated to constitute a dominant share in 2018. The segment is expected to be driven by factors such as the rising demand and production of integrated chips and electronic components. Gantry robots can be used for assembly, packaging, unitizing, sorting, scanning, and tray loading/unloading applications in production facilities. Additionally, the penetration of gantry/cartesian robots is increasing with the growing automotive manufacturing industry. In terms of geography, the global gantry/cartesian robot market has been classified into North America, Europe, Asia Pacific, Middle East &Africa, and South America. Asia Pacific is anticipated to hold a significant share of the market over the forecast period followed by Europe and North America. Further, the market in Asia Pacific is anticipated to grow at a significant pace in the near future due to emerging countries such as India, China, and South Korea. Some of the prominent players identified in the gantry/cartesian market include Güdel Group AG, Aerotech Inc., Bosch Rexroth AG, Ltd, ABB Ltd., Toshiba Machine Co.,Ltd., YAMAHA Robotics, STON ROBOT, Denso Corporation, and IAI America, Inc.